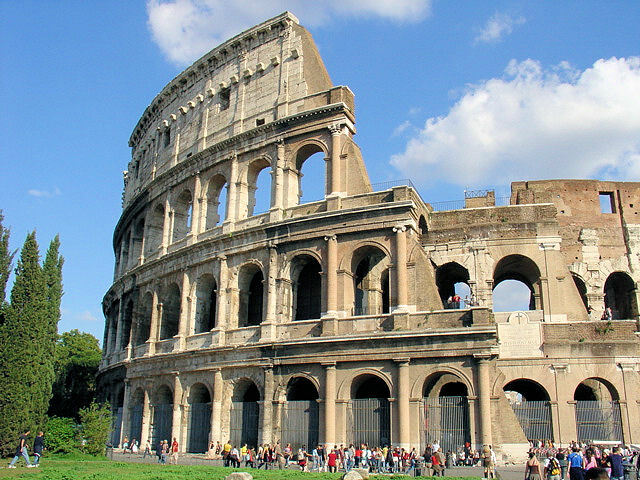 Roman Colosseum - A guided tour through a Roman wonder of the world! 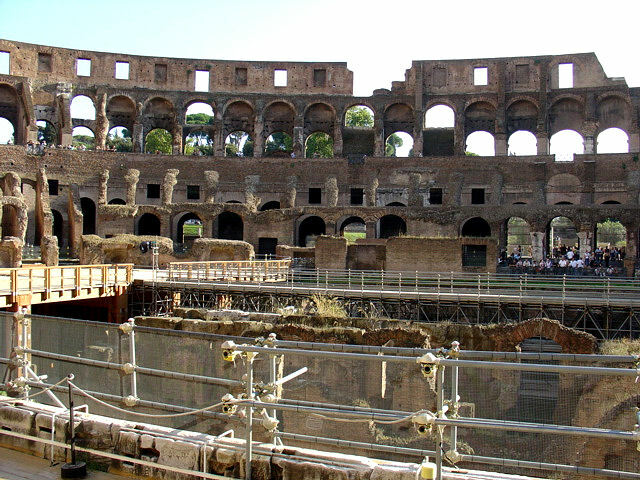 Roman Colosseum still stands after nearly 2,000 years! All content property of EuroTravelogue™. Unauthorized use is prohibited. Opening in A.D. 80, the Roman Colosseum has been standing for nearly 2,000 years – a testament to the tenacity and engineering prowess of the denizens of ancient Rome. This must-see on everyone’s Rome itinerary captures the imagination and one can’t help but be awe-struck by its sheer size, not to mention the fact that it’s been standing here for two millenniums! Are you ready to journey back to the age of the gladiator, back to be among the 80,000 spectators who attended any number of the public events to watch gladiators battle to the death, to witness public executions or to seek the thrill of the hunt? 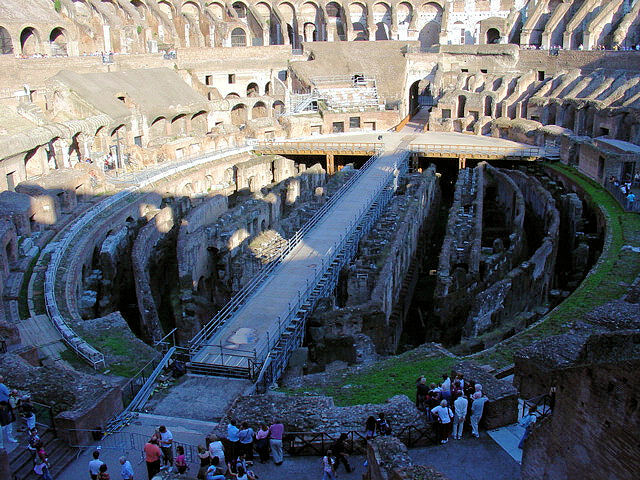 Come along on this guided tour of the Roman Colosseum. 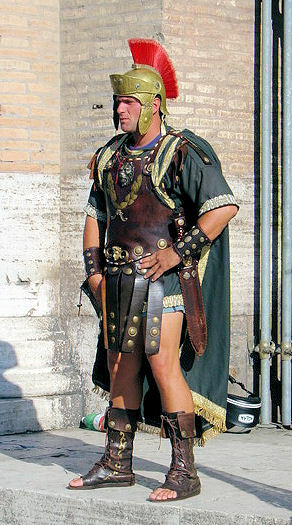 Fearless gladiators wait to greet visitors and of course for those token photographs of "you" at the Colosseum. Also known as the Flavian Amphitheatre because it was erected during the Flavian Dynasty between A.D. 69 and 96, the Roman Colosseum was built by three Flavian Emperors and opened to the Roman public in A.D. 80. It is uncertain how this structure came to be known as the Colosseum but two theories prevail: the first for the apparent reason – its titanic proportions; the latter and lesser known albeit more commonly believed, is that it is a derivation of the "colossal" statue of Nero that stood outside its gates of which only the base remains today surrounded by five trees. Note the three levels of increasingly ornate columns from Doric—most basic in design at the base, to Ionic on the 2nd level and finally, Corinthian—the most ornate in design on the 3rd level. Look closely at the architectural details of the Roman Colosseum and you’ll notice that the façade of its four levels are decorated with increasingly ornate columns as you ascend from its base of the structure. “Ionic” columns, the simplest in design, grace the lowest level followed by “Doric” columns on the second level which feature more ornate capitals at the tops. Finally, the third level features the most ornate of all – the “Corinthian” columns – the most decorative and stylized of the three with highly fashioned capitals topping them off. In its heyday, there were statues of Classical mythology filling the archways and niches in between the columns on the second and third levels. Sadly, none remains today. At the fourth level or “attic,” Corinthian pilasters embellish the façade and it was at this level, that an enormous awning – engineered with ropes and pulleys – cantilevered over the spectators protecting them from the harsh sun and rain. An unbelievable feat, don’t you think? Cavernous interior of the arena - from upper tiers to low-lying labyrinths of pens for gladiators and beasts alike. If the exterior fascinates you, wait until you venture within the shell of the Colosseum and gaze into the cavernous interior of this ancient arena. 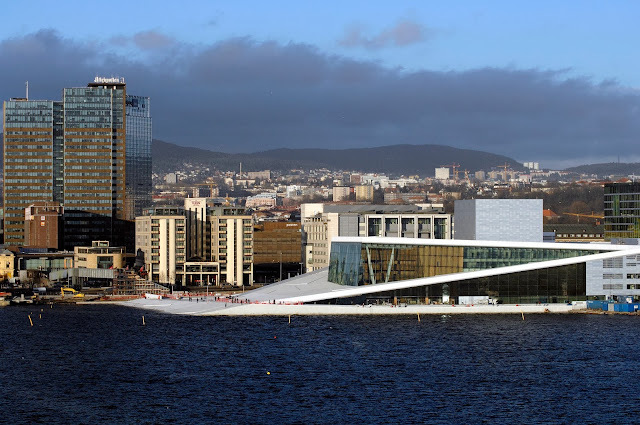 From its upper tiers to the low-lying labyrinths below, the entire view is quite a spectacle to behold! 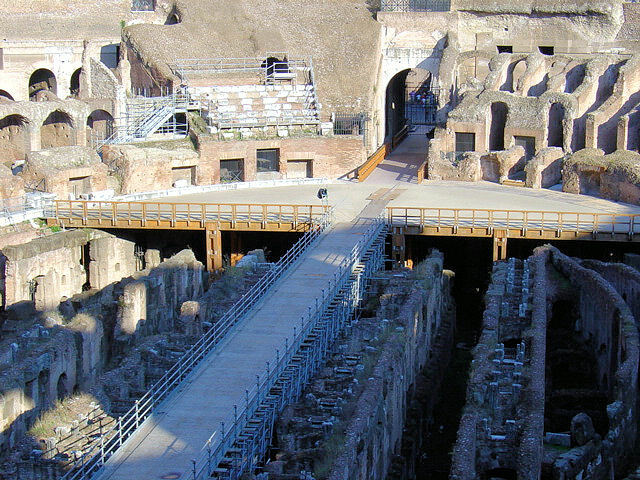 Look down to where the partially reconstructed wooden floor reveals the pens that housed the gladiators and wild beasts. 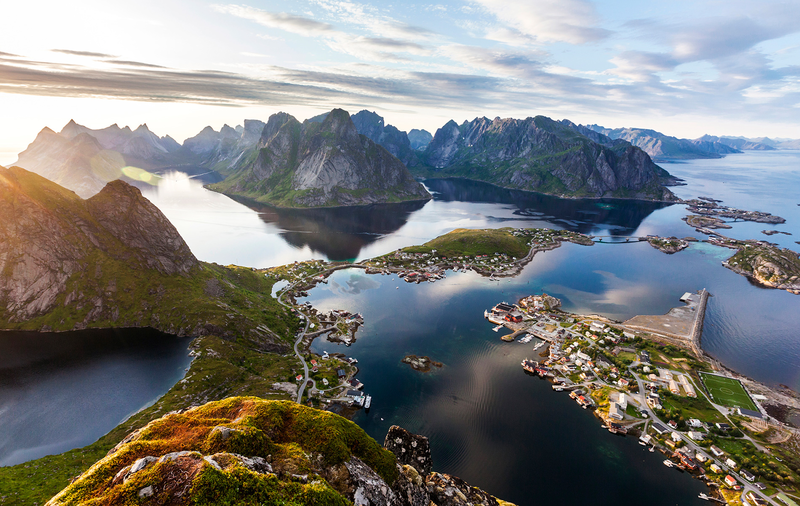 Then look all around, it’s absolutely breathtaking! As I toured through the colossal edifice, I couldn’t help but imagine what it was like to attend an event here 2,000 years ago. Roman Colosseum interior at floor level or what would have been the floor level. 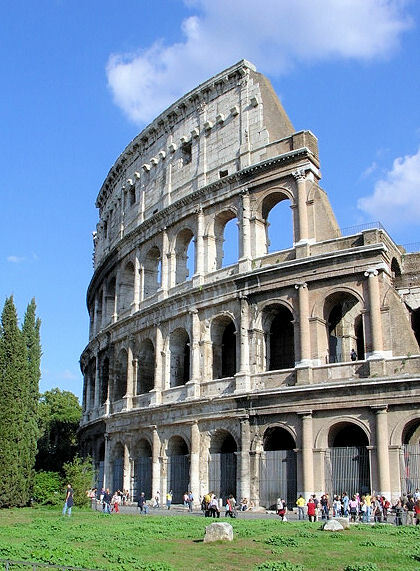 As far as touring the mighty Roman Colosseum, let me recommend either a guided tour or at the very least, an audio-guided tour in which you tote around a walkie-talkie device that churns out informative facts at directional cues along your route. On my tour, I chose the audio guide so I could take my time through this cavernous wonder and you can’t beat the price of a few Euro. The audio tour actually begins on the upper tier and proceeds around and down through the levels and finally the floor. Let me impart some advice before you go. Don’t rush to begin your tour. Take a few moments of time to wander around and immerse yourself in these ancient surroundings. After all, it's not every day that you're standing in the 2,000-year-old Roman Colosseum! Close up shot of the partially reconstructed flooring revealing the the maze of pens below. Pre-purchase your tickets to avoid the extremely long queues that can develop throughout the day. Check out ItalyGuides.it for an amazing virtual tour of the ancient ruin and for information on purchasing tickets. 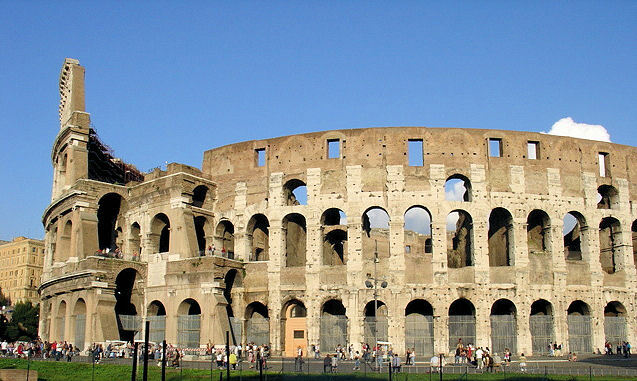 For the best value, purchase the combination ticket for both the Roman Colosseum and the Roman Forum. The audio tour mentioned above is only a few Euros and you pick up your equipment just inside the gates. If budget is no concern, let me suggest one of the many guided tours available. Prices range from approximately $75-$100 per person but are well worth the expense. Check out ItalyGuides.it, Roman Strolls or Viator Tours for starters. Lastly, be sure to do your homework and read a few of the guidebooks such as Rick Steves' Italy 2011 with map or DK's Eyewitness Travel Guide. A parting shot of the Roman Colosseum. Just outside the Colosseum, stands the Arch of Constantine which you'll see on your way to the Roman Forum just to the right of the photo. 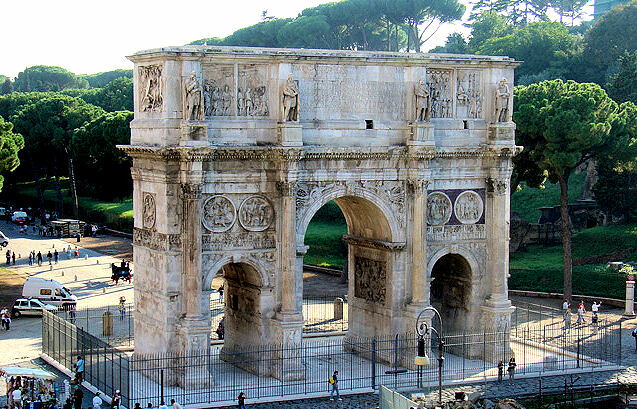 Constructed in 312 to celebrate Constantine's victory over Maxentius at the Battle of the Milvian Bridge, the Arch of Constantine was dedicated three years later in 315. Arch of Constantine remains after 1,700 years and commemorates Constantine's triumph over Maxentius. Oh you are so bringing back my Latin summer days! Best summer of my life. Thanks for such an inspired detailed post!! Glad I could evoke such wonderful memories. I too relived my experience writing this article...oh how I wish I were back again. Thanks so much for stopping by and sharing your thoughts! Colosseum is such a great place to visit. So much history. The only tourist trap is those gladiators standing outside. Haha They charged us like 10 euros for the pictures lol. It really is a must-see on all Roman itineraries!! Truly fascinating in every respect...2,000 years of history. Ha...those Gladiators but you just have to oblige them...after all, it's not everyday you can have your picture taken with one at this historical place....Thx for stopping by and sharing your experiences! What a beautiful summer time in Europe! Thank you so much Sailor for your comment. It was a magnificent time with brilliant weather!!! Please stop by again and share your thoughts! What gorgeous shots of the Colosseum. I feel like I am back in the days of the Romans. Your articles take me across the Rubicon. Thank you so much for your compliments, I really appreciate it. And, glad I can transport you through time ... how was the journey? ; ) Take care my friend! I LOVED my trip to Rome!!! These beautiful photos bring back great memories. Now I want to travel again! Hi Joann and thanks for the nice sentiments. I too LOVED my trips to Rome and I LOVE Italy!!! 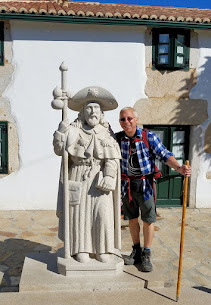 Keep exploring my blog and I will have you traveling in no time. Ha ha!! Hi Barry, What an intriguing tale you tell my friend!! Can't wait Google :) Thx for stopping by to share your thoughts. I really appreciate it! You've said the lowest level of columns is Ionic, followed by Doric column. The lowest level is actually Doric, then the Ionic, then the Corinthian columns and pilasters. Hello Anonymous and thank you so much for pointing that out. You are absolutely correct and I not sure why I got them mixed up. I am my own worst copy editor! Thank you for taking the time to bring this to my attention! !